Let me help you create a better day with these 9 Tips To Start A Morning Routine. I had a morning routine; it was to sleep as late as I could until I just had to get up. I usually would get up around 7:30 a.m., grab some coffee and then check my mail, Facebook and Pinterest. This was my me time, so I told myself. However, throughout my day I never seemed to carve out time for the things I really wanted to do which were devotionals, working on my blog and creative projects. These things were the authentic me; it’s what takes me to my happy place. I would try to squeeze these in after 9:00 p.m. until 12:00 midnight but I found I ended up just cruising Pinterest wishing I had the energy to do some of the decorating ideas, projects or recipes. I came to the point of realization that something had to change for me to feel fulfilled, which we all know makes a happier momma and wife, and helps me do my job as teacher, parent, and spouse much better. 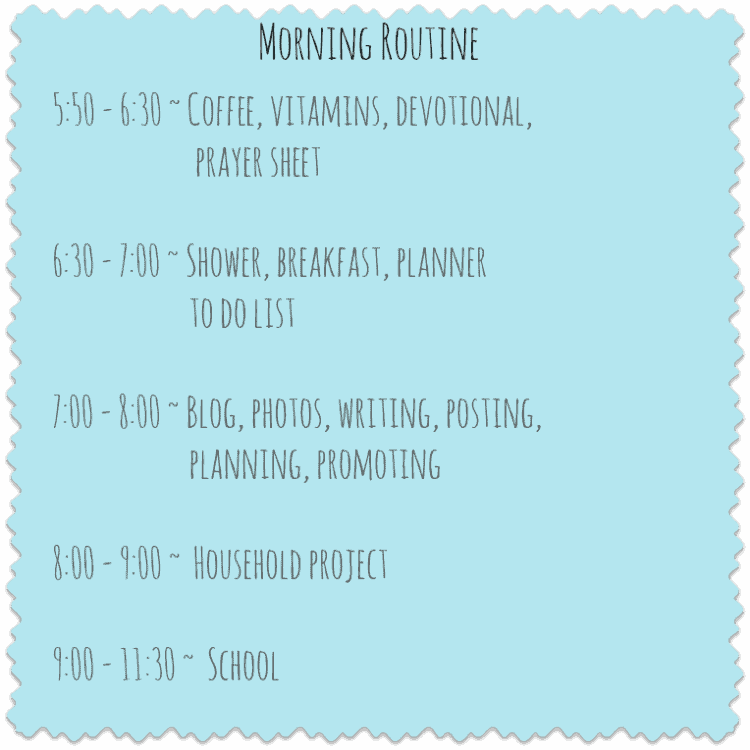 I learned some tips and ideas on how to start a morning routine that I would like to share with you so you can also feel like you have a more fulfilled and productive day. 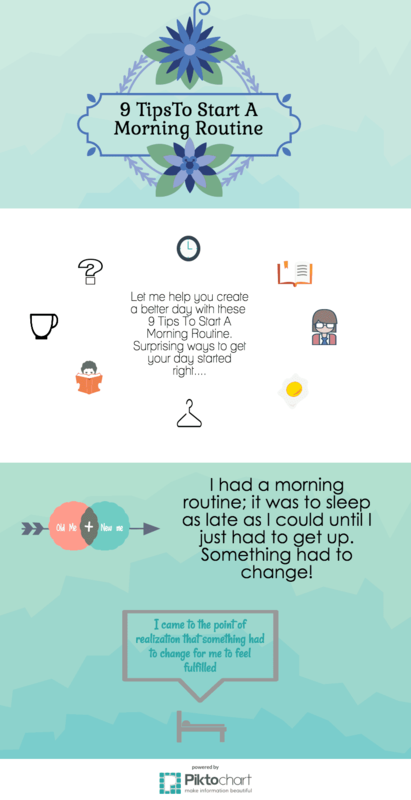 So let’s get started, here are your 9 Tips To Start A Morning Routine. I would suggest first getting a good alarm clock app. I am a slow waker so I needed something that would gently and slowly wake me up. I downloaded the app Alarm Clock HD by Alarm Clock Company. I paid the 99 cents so I would not have to see the ads. The reason I chose this app was it would allow me to wake to the music on my phone, not some annoying sound. I can also program how long I want to have the music to play softly and then allow it to get louder to wake me up more fully. For music, I chose one of my favorite lively composer’s albums, Vivaldi – 100 Supreme Classical Masterpieces: Rise of the Masters . It’s just zippy enough to energize me, and with 100 pieces, I never get tired of hearing the same thing. To get your new morning routine started, it is a good idea to give yourself a treat, so you have an inspiring reason to rise early. Buy yourself some special coffee or tea that you would not normally have. It’s sort of your mind bribing your body to get up. Try something like, Koffee Kult, which is an artisan small batch roasted coffee. Treat yourself! I preprogram my coffee pot to start brewing 10 minutes before my alarm goes off, that way as soon as I start to wake up I smell the coffee. 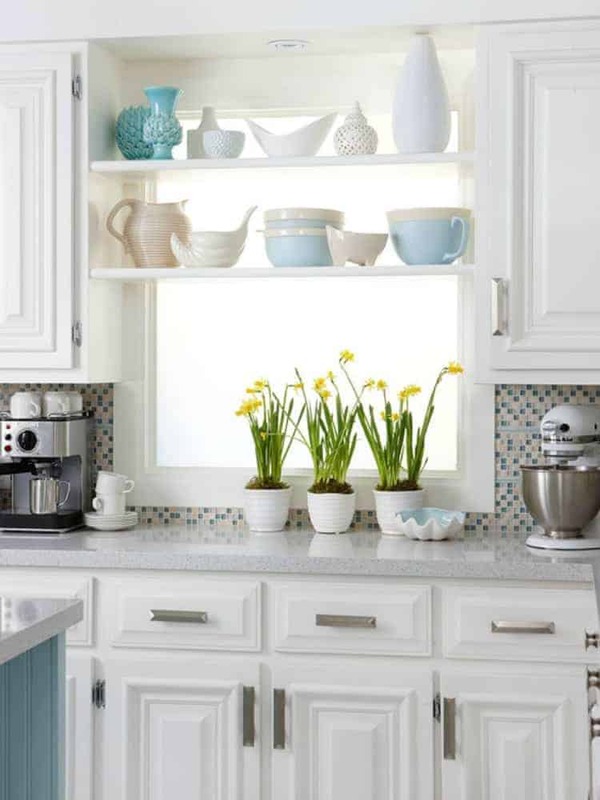 I would also encourage you to set up a coffee bar area; this could be in your kitchen or a corner of your bedroom. If we make it special, we will look forward to it, even if it’s before the sun comes up. After I have poured my coffee, I settle in a comfortable chair and have my devotion time. I read for about 10 minutes and then write my prayers out in my Filofax’s prayer pages. Taking this quiet time first thing in the morning will set a tone for your day, and it will become a time you look forward to each morning you rise early. I like to use my free printable prayer journal page and my free gratitude and affirmations planner printable. Next, I shower, but I don’t take the time to get fully ready, however. After my shower, I put on my “around the house” outfit. This entails something comfortable to work in and my shoes. I find if I’m dressed and have on my shoes my mind thinks it’s time to get my body going as opposed to wearing my pjs and slippers which made my mind think it was still time for one more cup of coffee before I get started. I don’t take the time to do makeup, and I allow my hair to dry naturally. I will take care of those details later if I have appointments. My goal is to get the most time-consuming part of getting ready out of the way. I then head to the kitchen and grab a simple, nutritious breakfast such as a breakfast bar or juice a drink. I love juicing; it’s all the nutrition in a yummy drink that gives me an energy punch to start my day. I then sit down with my planner and fill our my daily to-do list. You must have a vision for what your day holds and what you want to get done.If you would like a free copy of my to-do list to be sure and check out my post with a Free Printable To Do List. As I mentioned, I felt I never had time to do the authentic me projects in my daily routine. It seemed like as a mother and grandmother I was always meeting someone else’s needs instead of my own. For me to feel fulfilled, which makes me a happier momma and wife, and helps me do my job as teacher, parent, and spouse much better, I had to do some things that I enjoyed each day. God hardwired me with talents, and if I’m not using them, then I just don’t feel complete. Take time to ponder over what it is that makes you tick and feel complete. It might be exercising, your favorite hobby, learning a new skill, or working towards some goal in your life. Whatever it is scheduled it into your morning routine. Personally, I love blogging. I would like to make my blog a full-time job however in this season of my life I’m kicking cancer’s tail with chemo which makes even daily tasks challenging to get done, so it will have to wait. However, I am a much happier momma if I purposely carve out some short time each day for blogging. I don’t use this time just to write a blog post, but also I spend time reading books or other blogs to learn what it takes to run a successful blog, how to photograph better pictures, how to use Lightroom, and so forth. Once you have decided what it is you want to do, schedule it into your morning routine. I put blogging first before the kids are not up and which helps me get things done because I work better in quiet. I set a timer and work for one hour. Then I get the kids up and going and set the timer for another hour and work on a decorating project around the house that does not require my full concentration such as painting a room or refinishing a piece of furniture. That way I can interact with the kids, making sure their morning is off to a good start. So get your pen and paper out and start making a list of what is important for you to get done each day. As you are making your list remember to do something special for yourself. After you decide which tasks to do write them into time slots showing how long you want to spend at each task. Then it’s time to take those time slots and decide which ones you can fit into your new morning routine. Here is a sample of mine. Don’t get all detailed with this schedule, just highlight the main points. The key is to keep an eye on the clock or set a timer. Personally, I can get absorbed in something, and before I know it, I’m thirty minutes past the time I wanted to spend on the task. The focus on my schedule is to get several tasks that I personally want to happen in my life daily, which in turn will make me feel my day has had some events in it that are pleasing and encouraging to me personally. I encourage you, use these 9 Tips To Start A Morning Routine now. Ignore the desire to sleep just one more hour, get up and start enjoying your quiet time with the Lord and start your day doing tasks that make you a happier and more fulfilled. Thank you for your suggestions. I don’t drink coffee and have secretly wished for a hot cocoa machine so I could wake up to the smell of chocolate! :) That would be something worth getting up for. What a great idea to do cocoa! It’s all about looking forward to something yummy you enjoy to start your day. Wonderful tips. Thanks so much for sharing these. I’m not a morning person but would love to be! Glad to see you posting and praying you are doing better with each passing day.